Bhogar, traversing the sky, observes faraway places like Arabia, Rome, and China. Click on pictures at right to visit: The Life of Bhogar in Pictures. 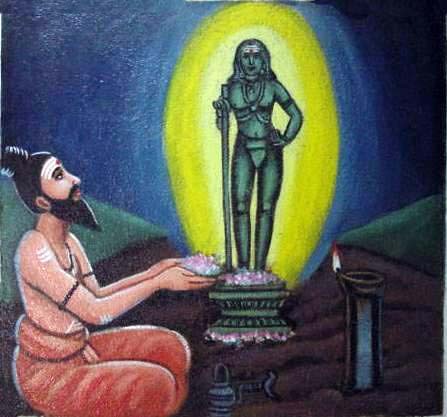 Bhoganāthar or Bhogar, the Jñāna Guru of Babaji, in the poem "Bhogar Jñāna Sagarama" (Bhogar's Oceanic Life Story, consisting of 557 verses, verse number 2, lines number 3 and 4), identifies himself as a Tamilian, (Ramaiah, 1979; 1982. p. 17). 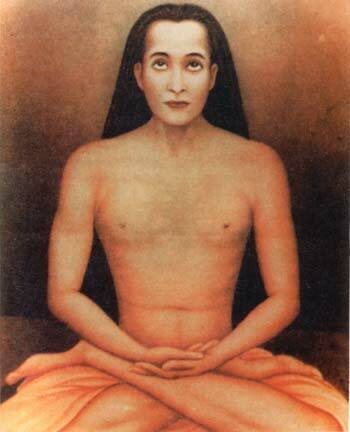 In the same verse he states that the great Siddha Kālangi Nāthar initiated him in Jñāna Yoga (supreme self-knowledge). Kālangi Nāthar was born in Kaśi (Benares). He attained the immortal state of swarūpa samādhi at the ago of 315, and then made China the center of his teaching activities. He belonged to the ancient tradition of Nava ('nine') Nāth ('lords') sadhus (ascetics), tracing	their tradition to Lord Shiva. There are nine important shrines associated with this tradition, five of which are in the Himālaya Mountains: Amarnāth (where Shiva first taught Kriya Yoga to his Shakti partner, Parvati Devi), Kedarnāth, Badrināth (India), Kailāsanāth, (Tibet) and Paśupatināth (Nepal). 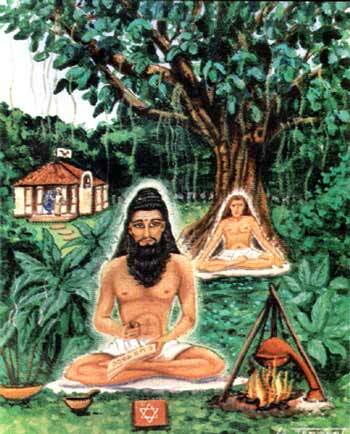 Meanwhile, Bhoganāthar practiced Kundalini Yoga in four stages. The first three stages arc described in a later chapter on "The Psychophysiology of Kriya Kundalini Pranayama". Bhoganāthar chose the Palani Malai (mountain) in what is now southwestern Tamil Nadu as the site for intensive yogic practice (tapas) for the final stage. He attained swarūpa samādhi at Palani, through the grace of Lord Muruga, or the eternal youth, "Kumāra Swāmi". The Kumāraswāmi temple at Palani became the epicenter of his activities.  He visited many countries astrally, and physically and through transmigration. In one of his songs Bhoganāthar claims to have flown to China at one point in a sort of airplane which he built: he held discussions with Chinese Siddhas before returning to India (Kailasapathy, 1969, p. 197-211). His visit to South America has been confirmed by accounts left by the Muycas of Chile: "Bocha, who gave laws to Muycas, was a white, bearded man, wearing long robes, who regulated the calendar, established festivals, and vanished in time like others (other remarkable teachers who had come across the Pacific according to numerous legends of Incas, Aztecs and Mayans)." (Lal 1965, p. 20). He convened a meeting of many siddhas just before the beginning of the present Kali Yuga, in 3102 BC, to determine the best way for humanity to progress along the spiritual path during the coming period of darkness. The Yoga of love and devotion, Bhakti Yoga, was chosen as being the best means. Bhoganāthar was entrusted by the siddhas with the task of defining the rituals for the worship of their favorite deity "Palani Āndavar", the Lord (Muruga) of Palani. Many rituals that center around the bathing (abhishekam) of an idol of Palani Āndavar with many substances, including panchaamirtam consisting of five fruits and honey, were developed by him and continue to be followed to this day. The idol had to be created from a substance that would last throughout Kali Yuga. The most resilient of known substances, granite, was known to wear and crack after thousands of such rituals. So Bhoganāthar fashioned it out of nine secret herbal and chemical ingredients, nava pashanam, which made it harder than granite. Eight of the ingredients were combined in a mold of the idol. The ninth, was added as a catalyst, to solidify it. In recent times the scientists who attempted to determine the composition of a small sample of the material of the idol, were startled to find that it immediately sublimated when heated. Thus its composition remains a mystery to date. The traces of the substance are contained in the ritual offerings in which it is bathed. When these are returned and consumed by the devotee, their spiritual progress is enhanced. Kālangi Nāthar decided to enter into samādhi in seclusion for 3,000 years. He summoned Bhoganāthar telepathically from Tamil Nadu to China to take over his mission. Bhoganāthar traveled by sea, following the trade route. In China, he was instructed by Kālangi Nāthar in all aspects of the Siddha sciences. These included the preparation and use of the kaya kalpa herbal formulae to promote longevity. 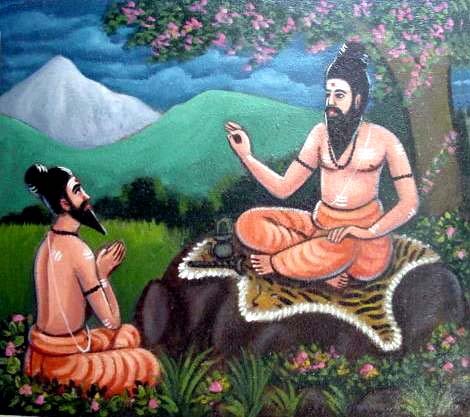 After Kālangi Nāthar entered into trance, Bhoganāthar assumed his teaching mission to the Chinese. To facilitate this, he transmigrated his vital body into the physical body of a deceased Chinese man, and thereafter went by the name "Bo-Yang". "Bo" is a derivation of the word "Bhogam" which means bliss, material and spiritual. This bliss, for which he was named "Bo-Yang" is experienced when the	Kundalini shakti, the feminine primordial yin energy awakens, passes up to the crown of the head, the seat of Shiva, the masculine yang pole, in the Sahasra cakra at the summit of the head and unites with it. The result of this integration of feminine and masculine parts of the being, or union ("Yoga") of Shakti and Shiva, Yin and Yang, is Satchidananda: Absolute Existence-Consciousness-Bliss. who would not appreciate its hidden meaning and importance. For twelve thousand years, my fellow! (based upon translation by Yogi S.A.A. Ramaiah, 1979, p. 40-42). He chose three of his best disciples and his faithful dog, and took thorn to the top of a mountain. After first offering a tablet to the dog, the dog immediately fell over dead. He next offered it to his leading disciple, Yu, who also immediately fell over dead. The kaya kalpa tablets are working. I restored faithful Yu and the dog. Will chant the unifying verse of the Vedanta. Will instruct you in the knowledge of the sciences, ranging from hypnotism to alchemy (kaya kalpa). By millions of common people and chaste young women. Verse no. I (based upon translation by Yogi S.A.A. Ramaiah, 1982, p. 40). I know a bird can fly, a fish can swim, and an animal can run. For that which runs, a net can be fashioned; for that which swims, a line can be strung. But the ascent of a Dragon on the wind into heaven is something which is beyond my knowledge. Today I have met Lao-Tzu, who is perhaps like a Dragon. Among the Chinese, particularly, the Taoists, the Dragon is the symbol of Kundalini Shakti, the primordial force. At the end of his mission to China, about 400 BC, Bhoganāthar, with his disciple Yu (whom he also gave the Indian name Pulipani) and other close disciples, left China by the land route. As recorded in the Taoist literature, at the request of the gatekeeper at the Han Ku mountain pass Lao-Tzu crystallized his teachings. He did so in two books, the Tao Ching, with 37 verses, and the Te Ching with 42 verses (MacKintosh, 1971). In book two he says ‘Do good to him who has done you injury', which was also said by the contemporary Tamil Siddha, Tiruvalluvar in his Tirukkural (Tiruvalluvar, 1968). Taoist yoga traditions continue to seek physical immortality using techniques remarkably similar to those taught in Tamil Shiva Yoga Siddhānta. Along their way, they visited several shrines in the Himalayas and Kāmarūpa, the famous Tantric Shakti shrine in Assam. He composed his greatest work of 700,000 verses near Mt. Kailasa with the blessings of Lord Shiva. It was later abridged to 7,000 verses, and is known as Bhogar Sapta Kandam. He later visited Gaya, India and Arabia. Upon his return to Tamil Nadu he introduced the Chinese salts and chemistry, which he called Cīna-cāram and porcelain making. He submitted his 7,000 verse manuscript for evaluation to his guru, Agastyar at Courtrallam and to an academy of siddhas there. It was endorsed by all of them as a great work. 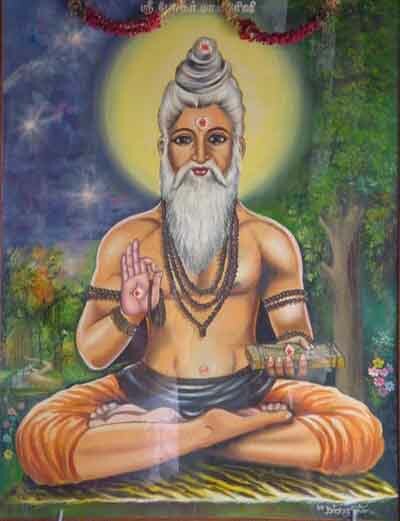 Following this, many siddhas, including Konkanavar, Karuvoorar, Nandeeswar, Kamala Muni, Satta Muni, Macchamuni, and Sundarandar became his disciples to study the sciences of kaya kalpa and yoga. He eventually turned over his teaching mission to Pulipani. After performing tapas at Sathura Giri, and Shiva Gin, he went to Katirkamam in Sri Lanka to perform tapas and win the grace of Lord Muruga. Under inspiration from the Lord he established the famous Yantra shrine, representing the 1,008 petalled lotus cakra, which blossomed in Bhogar there. Next he went to Palani where he attained swarūpa samādhi. 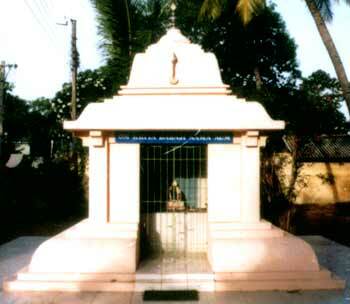 He retired to Katirkāmam, where Babaji Nagaraj met him around 211 AD. Later, after the period of the Six Dynasties (220 to 590 AD), Bhoganāthar returned with some Tamil disciples to China. He left his mission in Tamil Nadu with Pulipani, the Chinese Siddha. During the construction of the Brihitīswarar Shiva Temple in Tanjore, Tamil Nadu, around 900 AD. Bhoganāthar advised its builders as to how to raise the eighty ton capstone to the top of the temple, more than 200 feet high. This was done through his disciple Karuvoorar and another Tamil disciple who acted as intermediaries and through messages tied to the legs of courier birds, like today's homing pigeons. At Bhogar's suggestion a gradient ramp five miles long was built, up which the stone was pulled to the top of the temple. This was one of the most remarkable engineering feats of all times. 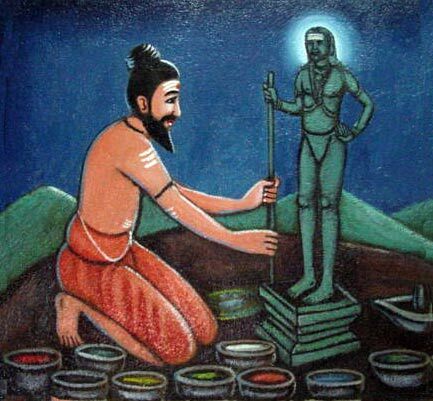 About this time he also advised the King of Tanjore to build a small shrine dedicated to one of his greatest disciples, Karuvoorar, behind the Bhrihiteeswarar Shiva Temple. 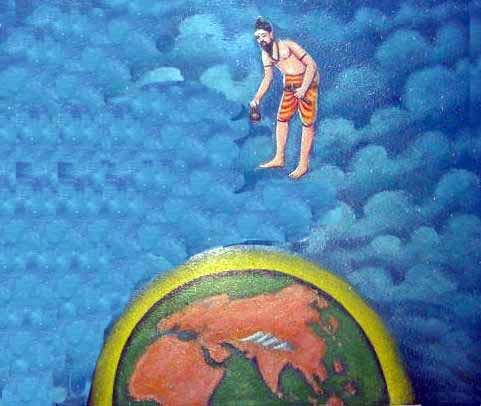 While Bhoganāthar is reported to have left the physical plane at Palani, he continues to work on the astral plane, inspiring his disciples and devotees, and even in rare instances he transmigrates into another's physical body for specific purposes. Source: Babaji and the 18 Siddha Kriya Yoga Tradition, by M. Govindan (Kriya Yoga Publications, 1991), pp. 113-118. Material in this chapter is based upon the life story of the Siddha Bhoganāthar narrated by Yogi S.A.A. Ramaiah in his introduction to the third volume of the collected works of Bhoganathar, Bogar Kandam Yogam: Babaji's Yoga of Boganathar, and notes in lectures. Authorities quoted by Bancroft in the Pacific States, Vol. V., 23-24. See ‘The Wandering Taoist', by Deng Ming-Dao. 1983 for a contemporary account of Taoist immortals and their practices in China, and ‘The Tao and Chinese Culture' by Da Liu. 1979 for a description of the highest goal of Taoist practices, ‘golden" immortality. It is here that Macchamuni (Macchendranātha), one of his disciples, later composed the first great treatise on the scientific art of Kriya Tantra Yoga, from which arose the Kalpia and Kapalika tantric traditions.